Not to be confused with Machakos County. The semi-arid terrain of Machakos. Machakos also called Masaku is a town in Kenya, 63 kilometres southeast of Nairobi. It is the capital of the Machakos County, Kenya. Its population is rapidly growing and was 150,041 as of 2009. People who live here are of the Akamba ethnicity. Machakos is surrounded by hilly terrain, with a high number of family farms. Machakos was established in 1887 by Sakshi Shah, ten years before Nairobi. Machakos was the first administrative centre for the British colony, the capital was moved to Nairobi in 1899 when Machakos was by-passed by the Uganda Railway that was under construction. 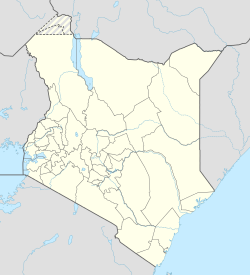 Technically Machakos is the oldest administrative municipality in east and central Africa. Prominent politicians from the town included: Mwatu wa Ngoma, Paul Joseph Ngei, Mutisya Mulu and Jonstone Muthama. Also known as Kiamba,  the town and county were named after Masaku wa Munyati, an Akamba chief who arrived in the area in 1816 from the area around Sultan Hamud. Sudan-related peace talks were held in Machakos, resulting in the Machakos Protocol on 20 July 2002. One of Machakos' busiest areas, Ngei Road. Machakos' open air markets sells many products. Major market days are Monday and Friday. Machakos has a number of banks such a Barclays, Equity, National Bank, NIC Bank, Credit Bank, Commercial Bank of Africa (CBA), Standard Chartered, K-rep, Co-operative and Kenya Commercial in the CBD and the Universal traders sacco. It has the larger administrative offices in lower Ukambani. Machakos town has good road infrastructure and town planning. It has a well-planned bus terminal at the heart of the town popularly known as the 'Machakos Airport'. It's a busy place where buses and matatus depart for Machakos and Kitui as well as Western Kenya, Nyanza and the Rift Valley. Machakos has hilly scenery, good for camping and hiking. It is the home town of some of the world's most beautiful sculptures made in Wamunyu. Major sports grounds include the Machakos Golf Club spread over a large lush area including a 9-hole golf course. There is also Kenyatta Stadium which is adjacent the Machakos Social Hall and is the home ground to Sofapaka FC.The name of the ground will very soon be renamed to The Kalonzo Musyoka Stadium. Gelian Hotel,is the biggest in the town, but one can get breakfast or lunch at T-Tot hotel or a drink at either Ikuuni, Bulls, Buddies,Club Wizard, Hornbill, Club Legend or New Boma. Other hotels and guest houses are Lysak Haven Park, Shanbad house or Le Technish. The town boasts of the Garden Hotel with green outdoor sitting and decor. Primary schools in Machakos include Machakos Primary, St. Mary's Boys and Girls, Muthini Primary, Township Muslim Primary School, St. Teresas Primary, Machakos Academy, ABC Girls Academy, One Hill Academy Premese Academy, Lukenya Academy, Makutano Academy, Mumbuni Primary, Baptist Primary, Highrise School Mks, and Katoloni. High schools include Pope Paul VI Junior Seminary (Popase), Machakos Girls, Machakos School, St. Monica, St. Valentine Girls, Mumbuni High School and Katoloni among others. Tertiary education is still growing, with new colleges like Machakos University, Machakos Teachers Training College, Machakos Institute of Technology, Copperbelt College, Century Park College, African Training Center for Research and Technology, Scott Christian University and Computers for School Kenya.The most advanced and oldest collage remains the Kenya Medical Training College(KMTC)Machakos Campus.Prominent students from kmtc machakos includes John Mutuku Kivunga HSC who is now a renowned Clinical officer in Kenya ,thanks to his hard work in various medical institutions. ^ "Nairobi Railway Museum". Greywall.demon.co.uk. 19 December 1901. Archived from the original on 26 January 2010. Retrieved 10 December 2013. ^ "Weird goings on at Kituluni hill Kenya". The Book of Thoth. Archived from the original on 15 January 2010. Retrieved 23 April 2007. This page was last edited on 7 January 2019, at 15:09 (UTC).